Any foreigner who has a permanent or temporary residence permit may start his own business in Poland on the same terms as local citizens. Even though starting a business itself is extremely easy, it is necessary to fill in a number of documents. What documents exactly do you need? 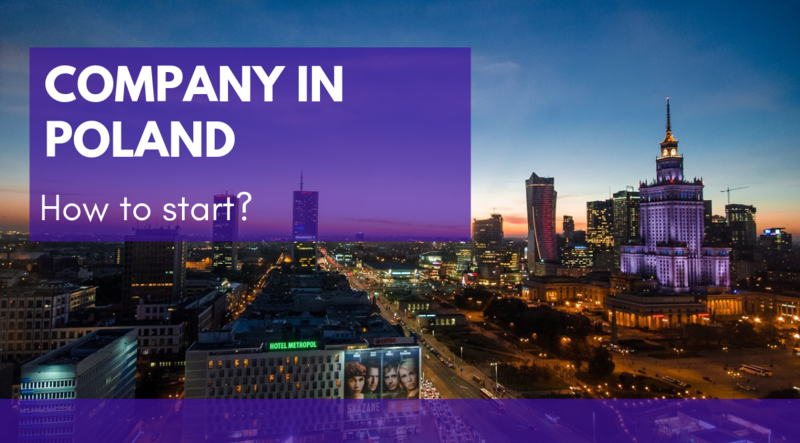 Why is it worth starting a company in Poland? Why is it worth starting a company in Poland? Poland, as one of the few countries in the European Union, can boast a constantly increasing level of GDP and a stable economic policy. Even at the time of crisis in 2015, Polish economy increased by about 2%. Poland, as a developing country, is increasingly opening up to foreign investors – tax breaks, clear legal regulations and low employment costs prove to be useful. Each of these companies gives different opportunities and responsibilities. A one-man business, however, seems to be the most profitable at the beginning. It stands out by low fees – 19% income tax with a flat tax as well as numerous tax concessions. How to start a business in Poland? Foreigners may conduct business in Poland on the same terms as Poles. However, to start a company, it is required to fill in and deliver appropriate documents. CEiDG-1 registration form is the most important in the process of starting your own company. As the name suggests, it serves the legal registration of the company. To complete the form, you must have a document confirming your identity, such as your ID card or a passport. It is also necessary to provide entrepreneur’s PESEL number, which can be easily obtained. One of the headings in the CEiDG-1 form concerns the address of residence and the registered office of the company. It is worth taking care of beforehand, so that you can provide the officials with a document confirming your right to stay on the premises (tenancy agreement is sufficient in this case). The type of activity specified in accordance with the code list of Polish Classification of Activities (PKD) must also be provided in CEiDG-1. To find a code that will fit your company, go to pkd.com.pl and use the search engine there. After your application is approved, the office has 14 days to register the company, although in practice you can enjoy your own business even on the following day. However, starting a company itself is not enough to be able to legally make a profit out of it. It is necessary to get a REGON (form RG-1) in the statistical office, as well as the company’s stamp, which will confirm the legal value of documents issued by the given activity. You must not forget about the tax office. Here it is necessary to have a NIP (NIP-1 form) which, in the case of a sole proprietorship, will be the same as the entrepreneur’s. At the Social Insurance Fund (ZUS), there will be several forms to be completed, however, their number depends on whether employees are self-employed or work for an employer. The wide range means that every form of business can be tailored to possible options. In addition, Poland is a well-developing country, and open to foreigners, which makes it worth starting your business here. How to start a private limited company (LTD)? A private limited company can be easily registered online (so called S24) or concluding a company agreement which require a notarial deed. 1. User registration in the eKRS system. Using the eKRS system is available both for Polish citizens and foreigners. 4. Generating of documents and application. • signature with a Trusted Profile (to be able to register on the Trusted Profile page). 6. Application fee payment by external electronic payment system. 8. Entry to the National Court Register. The company Management Board, within seven days from the date of its entry in the register, submits to the registration court a declaration of all members of the management board that cash contributions to cover the share capital have been made by all partners, if such a statement had not been attached to company’s registration form. Filing a statement is subject to a court fee of PLN 40.9. Tax on civil law transactions (PCC). 9. Tax on civil law transactions (PCC). You must submit a correctly completed PCC-3 declaration, calculate the tax by yourself and make a payment within 14 days from the date of the execution of a deed of company formation. The taxable amount is the value of the share capital reduced by the cost of entry in the National Court Register and the announcement in the Court and Economic Monitor (the handling fee is not deductible). The PCC tax rate on the company’s agreement is 0.5%. Ekspansja na rynki Bliskiego Wschodu. Prowadzenie działalności w Zjednoczonych Emiratach Arabskich. Doradztwo w zakresie przygotowania firm do wejścia na rynki perspektywiczne Zjednoczonych Emiratów Arabskich. Misje gospodarcze i imprezy targowo wystawiennicze w Dubaju. Wizy do Dubaju. Wizy Pracownicze.